The Shabby Stamper: Peace on Earth! 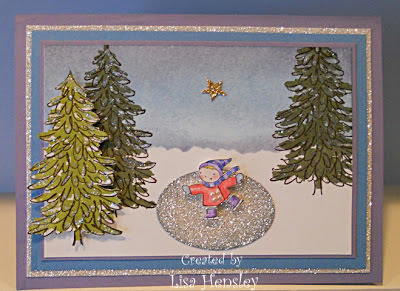 Here is another card that fulfills the Holiday glitter, glam or glitz challenge for this months' Creative Crew -- I think that this is one of the most fun and festive cards that I've ever made! When I saw that you could color silver Glimmer paper, I knew that I wanted to use the little skater kid from Wonderful Winterland and make her a "skating pond". I cut out her "pond" from silver Glimmer paper, cut it with the Large Oval punch, then sponged the edges with Marina Mist. Also, you can't see it, but the trees from Evergreen are heavily dusted with Dazzling Diamonds glitter. The sky was sponged using Bashful Blue, Marina Mist and Wisteria Wonder and a single star cut from the gold Glimmer paper is hung there. Squeeee... this one is darling too. I love the pond and the trees and the sparkle. Oh my!